Nam H Nguyen is a Melbourne based freelancer. His publications can be found online at The Australia Times magazine and on his personal blog, Scratches and Scribbles. An Australian by birth, Nam is a major in Creative Writing and English literature. He can be found perusing Melbourne’s many laneways blanching at the prices of tea. Imagine if your father operated your childhood as a social experiment. That is the life of the younger Rosemary Cooke, a life of the apathetic notes and scientific assertions. Now older, her twin sister, Fern has disappeared and her older brother, Lowell, has run away – leaving her with only her mother and father. Weeks after having finished the novel, I still stare at its cover and her voice still echoes with her grief. Awkward and lonely, Rosemary hides from many things in life, but she doesn’t shy away from everything – and it’s with this determination, that she won’t lose her parents, or herself too. Author of the 2004 critically acclaimed Jane Austen Book Club, now a film, Karen Fowler has again brought to us a modern work of art.Interspersed with her natural charm, Rosemary Cooke makes for an endearing protagonist. With such talent that couldn’t be done otherwise, she comes too readers as isolated, and then ordinary – and suddenly she leaves you unique and profound. Now older, her voice she echoes with youthful jubilance, and her intelligence and wit leaves you with observations that you can take with you for life. It’s this complexity –Rosemary’s voice and Fowler’s skill that reshapes your typical family drama into something more relevant today. Readers would forgive the authorsdiscourse, only because it integrates so seamlessly into the structure of the narrative. What happens when you remove the word human from human being? That’s what half the people I knoware today. Humans or beings, both aspects are important to the modern representation of humanity. Fowler’s greatest achievement is not her innovation on family drama itself – but rather how she sets about asking questions which otherwise are so heavy handed. Ultimately, the narrative asks us to accept the reality of the world which we live, but leaves us with emotionally charged knowledge to decide our own. It’s through novels like these, where we can ponder a little bit, and put the word ‘human’ back where it belongs – right beside the word ‘being’. Prologue: First of all I want to pass on a big, big hug to Sucheta for inviting me not only for an interview on her blog but also for this guest post. It came to me out of the blue and I feel honored I was considered. Feel strongly hugged again, Sucheta! My book I’m Free – Awareness of Who You Are by Discovering Who You Are Not!Is a guide from fear, self-doubt, and misunderstandings accumulated over a life time to awareness, clarity, and a conscious reconnecting with the powerful and creative spirit we are. When we feel this connection, we have access to unlimited possibilities in order to live the life we always dreamed of. Happiness – real solid happiness– results from it. I thought this might be an interesting topic for this guest post. I hope you enjoy it. Everybody wants to be happy. But still so many people believe that happiness is something they get from outside. But that’s not true. True happiness is an aspect of our Self. We don’t need to hope for it, beg for it, or even fight for it. Don’t fight for anything. Fighting for something says that you believe in a lack. You believe that you lost something or something was taken from you. Fighting for happiness would mean that happiness is something you have to get, something you could lose, or something you are gifted with. Fighting for happiness is a conviction that you need to get it from outside. But this whole fight is a big misunderstanding. You are created from the image of God which means you are love with everything you are. You are light and bliss into the deepest core of your being. Happiness is an inseparable part of this love. So how could you ever need to fight for happiness when it has always been part of yourself? Let the outside world be outside and make yourself aware of who you are. You will find happiness and any empowering feeling always (and only) within you. Yes, we can be inspired by the outside world to rediscover happiness. But even then it leads us inside again where this flame has always been burning. Everything you were looking and fighting for so desperately lies within you waiting patiently for the moment to be called from its sleep. It has been never gone but only unseen because of a misunderstanding due to the belief into an illusion. Whenever you think you had to fight for love, peace, happiness than just because you started to believe more in what you see outside of you instead of what you are always connected with, always have, and never can lose. Of course there can be events in our lives which can make us sad. But sadness is not the same like unhappiness. I was very sad when my father died, I was sad when my pets died. I was sad when I had to let go of dreams. But what kept my feet on the ground was the carpet of happiness I have been walking on. This happiness as a basic condition. It is the reason for my power and strength during sad times. Happiness is an aspect of love. Love is God and you are an aspect of God. Carrying his spark within you. Happiness is always with you. Whatever good you have is all from God. Whatever evil, all is from yourself. I thank Erika for this lovely post. You can go through her own blog by clicking here. NOTE: I know you all must be confused as to why I am posting old posts now? Well, these are posts from my erstwhile blog (sounds so royal) and I have had people read them last year. But to my new readers, these are fresh posts and I don’t want them to miss out on any book related posts 🙂 So I will be re-posting random blogs, which some of you might have already read. The day I started blogging on WordPress, I have been meaning to write about Enid Blyton. The famous English children’s author was introduced to be by a dear friend. She gifted me a book of stories and then the Enchanted Wood – the first book in the Faraway Tree series. Two books were not enough to satiate the budding reader in me. I yearned for more and more. I borrowed them from friends, libraries, bought them and did whatever it took to absorb the finesse with which she used to write the books. 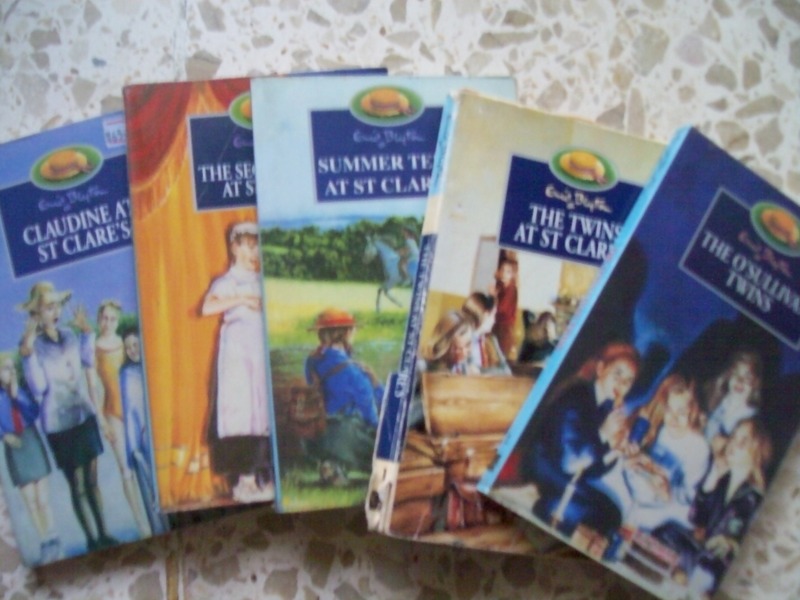 I loved to read her St.Clare’s and Malory Tower series. Based on boarding schools, these books made me value my friends, school and teachers even more. I laughed with the books and I was immensely inspired to work hard like the girls did, to come up with good grades year after year. I also loved her Five Find Outers series more than the cliched Famous Five or Secret Seven! Even now, when I visit bookstores, I discreetly comb through the kids section to check out some of her work and give a quite hi5 to the child in me 😀 It is really soothing to touch the spines of books in person although the new editions make me cringe! I am really sorry for the children who miss out on her epic collection and stay afar from the joy of reading one of the purest forms of children’s literature. I am sure that there are parents, uncles and aunts and even teachers, who keep the tradition alive by introducing her work to kids. But on a large scale, many of them have no clue as to who she was. Here is a guest post by Adi talking about her love for the author and her books. Which Book Has Inspired You/Changed You And How? Was going through Buzzfeed, where there is a list of books that have changed people’s lives. Now I wonder which of the books have changed me as a person or have inspired me. 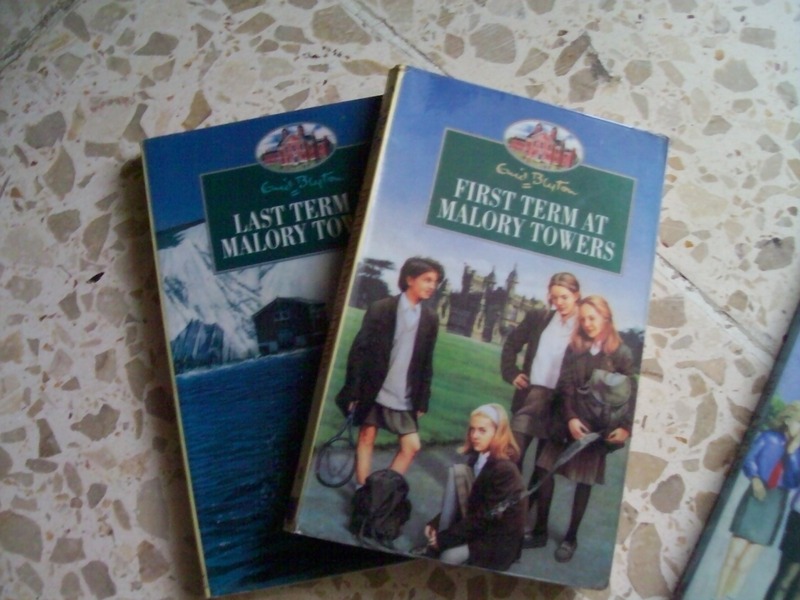 Enid Blyton Malory Towers and St.Clare’s. Made me work hard at school and taught me lessons in friendship. The Boy In Striped Pajamas. Makes me numb in knees. Its a recent addition, but had a real big impact on my psyche. Pride and Prejudice. Made me read more of Austen and the Bronte sisters and thus, improved my English. Oliver Twist. I realised that I can’t stand injustice of any sort. Kusum. It was an NBT book and taught me about child labour. A must-read to know the nuances. A Thousand Splendid Suns. I read it first and then the Kite Runner. Followed by the Mountains Echoed. But it will be one of the books I can read from any page. And fall in love with it over and over and thought that if the protagonists could, I could too. The Penultimate Safari. Nadime Gordimer’s story took me to Africa and the civil war torn nation. Made me thankful for living in much better conditions. A Gathering Light. All those pseudo feminists out there…read this. A Golden Age and The Namesake/The interpreter of Maladies/Unaccustomed Earth. Made me feel more Bengali than anyone else could. You tell me, which books have left their imprints on you? Prologue: There are some books, which refuse to fade from our memories, no matter how hard we may try. Most of such books are classics and it will not be surprising if they have been passed down thorough several generations. As the very first post of my guestblogs, I present Adi, who is a talented young gun having her blog called The Happy Lifeaholic. Once upon a time Adi used to be an avid reader. I was the kid who read through math and physics classes. I walked into walls because I was so intent on whatever book had caught by imagination on that day. I wrote a book report on The Merchant of Venice (an abridged version) in Grade 3 while my classmates were still on fairy tales. I also managed to ruin my eyes at the tender age of 9, all because I would stay up past “lights out”, reading by the diffused beams of a streetlight filtering in through the curtains of my room. I loved books. Even the word “loved” sounds like an understatement! But alongside all the abridged classics that I wolfed down as a kid, were books by an author who I grew to love over the years. Dame Enid Blyton wrote books like no other. She wrote stories of mysteries, and of school kids and of escapades and treasure hunts. She was an English writer (as if Dame didn’t give that away) and her books have been bestsellers since the 1930s. According to my trusty friend, Wikipedia, she’s since sold over 600 million copies of her books, and has had them translated into over 90 languages! Of those 600 million books, I probably own about 50. These are only some of the books that I chose to bring back to Oman with me. My relationship with Dame Blyton started long before I started reading any of her books – it started with a series of her books that was made into a television show that eventually got dubbed into a very obnoxious Hindi version that would make its round on Saturday morning television channels in India. That’s right, folks! I’m referring to the wooden wonder boy from Toyland – Noddy! For years I didn’t realize that the series was but another one of Enid Blyton’s works, and trust me, I watched that show for yeeeeaaaars. 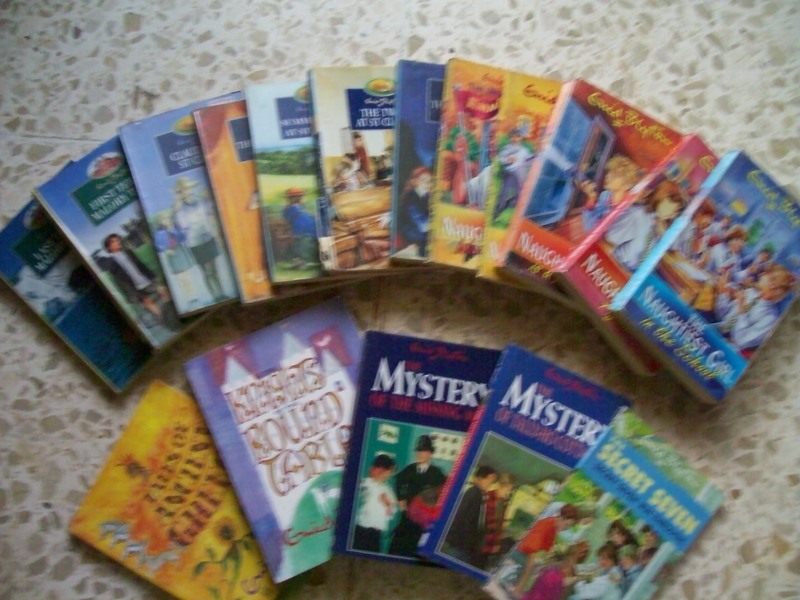 At some point mom bought me all the books as well, so that’s 24 Enid Blyton books right there. Enid Blyton is today, most remembered for series such as Famous Five and Secret Seven – both juvenile detective series, featuring (as the names suggest) five and seven kids, respectively, solving crimes and getting into all sorts of shenanigans. Those books were, and still are, widely read across India – and I remember those being some of the most borrowed books in our school and local libraries among kids from my age group, right alongside all the Nancy Drew and Hardy Boys books. The books really were a hoot – all the adventure kids could ever dream of, and E.B’s writing was always very simple to understand and yet, she had a way with words. She never really used flowery language, but she described everything perfectly. In fact, I blame her for my longtime obsession with wanting to become a detective. Once I was a little older, TV shows like NCIS etc did nothing to lessen that obsession. My favorite E.B books, however, were her comparatively less famous ones – The Naughtiest Girl series, St. Claire’s and Mallory Towers series. All three are boarding school series, and now that I think about it, perhaps that is why they weren’t as popular. I remember that when my friends and I were young, sending a kid off to boarding school was the ultimate punishment – India’s take on the boogyman scare, if you will. I think it still is. Enid Blyton, however, corrupted my vision of boarding schools completely. Thanks to her, I grew up thinking of boarding schools as places where you made friends for life, woke up at midnight to throw secret dinner parties where you wolfed down ginger ale with the other gals in your dorm, and where you pranked your professors and went skinny-dipping in the lake at 2am. Hell, she made boarding school sound so exciting that I was probably the only kind I knew who actually used to beg her family to send her to boarding school! I literally used to dream of going to boarding school at a time when over-dramatic India movies and TV serials would show families breaking up over the decision of sending a child to boarding school. Oh the shame! And there I was, begging to go. I remember almost joining a boarding school in 8th grade, when we’d just moved back from Oman – I was set on the place till they asked some personal questions in the interview that I didn’t think they needed to know, and eventually that made me cut the school out of my future plans. It was a blow, though, to know that I had been so close to living that childhood dream, attending an elite and expensive boarding school nestled in the Sahyadri Hills of Pune, hobnobbing with A and B list Bollywood kids. But that’s alright. I went right back to E.B’s books, and read and re-read them till I knew all the stories backwards. The girls in all those books were the sisters I never had while growing up. They were my imaginary friends and confidants rolled in one, and the time I invested in those books were both satisfying and exciting. Did you have a favourite character or book when you were young?